, an eminent English prelate, descended from an ancient family, was born in 1657, at Blandford, in Dorsetshire, where his father, of the same names, was a gentleman of considerable property. 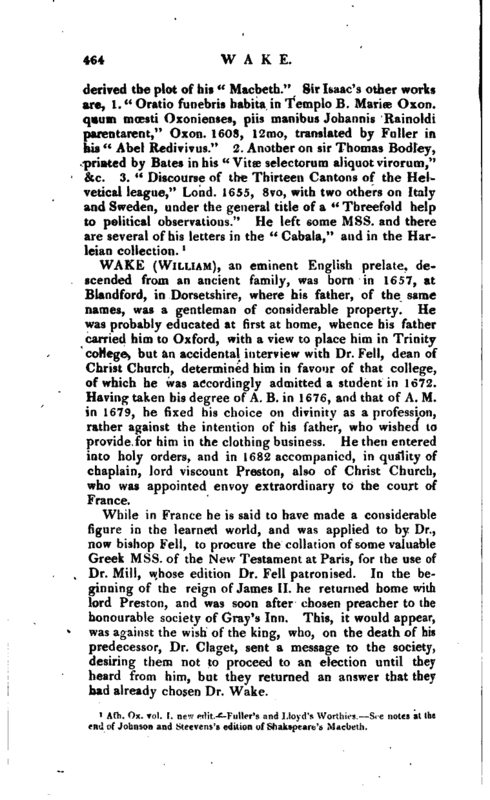 He was probably educated at first at home, whence his father carried him to Oxford, with a view to place him in Trinity college, but an accidental interview with Dr. Fell, dean of Christ Church, determined him in favour of that college, of which he was accordingly admitted a student in 1672. Having taken his degree of A. B. in 1676, and that of A. M. in 1679, he fixed his choice on divinity as a profession, rather against the intention of his father, who wished to provide for him in the clothing business. He then entered into holy orders, and in 1682 accompanied, in quality of chaplain, lord viscount Preston, also of Christ Church, who was appointed envoy extraordinary to the court of France. While in France he is said to have made a considerable figure in the learned world, and was applied to by Dr., now bishop Fell, to procure the collation of some valuable Greek Mss. of the New Testament at Paris, for the use of Dr. Mill, whose edition Dr. Fell patronised. In the beginning of the reign of James II. he returned home with lord Preston, and was soon after chosen preacher to the honourable society of Gray’s Inn. This, it would appear, was against the wish of the king, who, on the death of his predecessor, Dr. Claget, sent a message to the society, desiring them not to proceed to an election until they heard from him, but they returned an answer that they bad already chosen Dr. Wake. | During his residence in France an incident occurred which occasioned his first appearance as an author, and his being known as an able writer both at home and abroad. Bossuet, the bishop of Meaux (See Bossuet) had now published his very artful “Exposition of the Roman Catholic Faith,” a copy of which came into the hands of Mr. Wake, who, in the preface to his Answer, gives a very curious account of the different alterations the work had undergone, in order to answer the real purposes for which it was written. He observes, that “the first design of monsieur de Meaux’s book was either to satisfy or to seduce the late mareschal de Turenne. How far it contributed thereunto I am not able to say, but am willing to believe that the change that honourable person made of his religion was upon somewhat better grounds than the bare Exposition of a few articles of the Roman faith; and that the author supplied either in his personal conferences with him, or by some other papers to us unknown, what was wanting to the first draught, which we have seen of this. The manuscript copy which then appeared, and for about four years together passed up and down in private hands with great applause, wanted all those chapters of the Eucharist, Tradition, the Authority of the Church and Pope, which now make up the most considerable part of it; and in the other points which it handled, seemed so loosely and favourably to propose the opinions of the church of Rome, that not only many undesigning persons of that communion were offended at it, but the protestants, who saw it, generally believed that monsieur de Meaux durst not publicly own what in his Exposition he privately pretended to be their doctrine. And the event shewed that they were not altogether mistaken. For in the beginning of 1671 the Exposition being with great care, and after the consideration of many years, reduced into the form in which we now see it, and to secure all, fortified with the approbation of the archbishop of Rheims, and nine otheV bishops, who profess that ‘ having examined it with all the care which the importance of the matter required, they found it conformable to the doctrine of the church, and as such recommended it to the people which God had committed to their conduct,’ it was sent to the press. The impression being finished and just ready to come abroad, the author, who desired to appear with all advantage to himself and his cause that was possible, sent it to some of the doctors of the Sorbonne for their approbation | to he joined to that of the bishops, that so no authority, ordinary or extraordinary, might be wanting to assert the* doctrine contained in it to be so far from the suspicion the Protestants had conceived of it, that it was truly and without disguise Catholic, Apostolic, and Roman. But, to the great surprise of monsieur de Meaux, and those who had so much cried up his treatise before, the doctors of the Sorbonne, to whom it was communicated, instead of the approbation that was expected, confirmed what the Protestants had said of it; and, as became their faculty, marked several of the most considerable parts of it, wherein the Exposition by the too great desire of palliating had absolutely perverted the doctrine of their church. 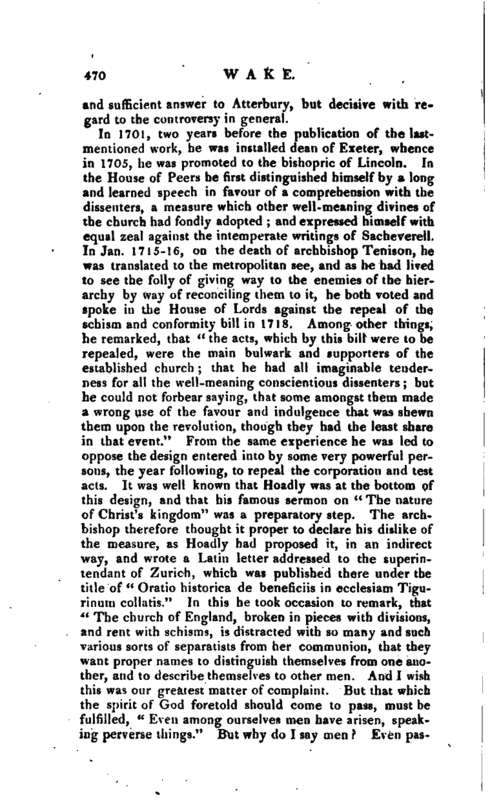 To prevent the open scandal, which such a censure might have caused, with great industry and all the secrecy possible the whole edition was suppressed, and the several places, which the doctors had marked, changed; and the copy so speedily sent back to the press again, that in the end of the same year another much altered was publicly exposed, as the first impression that had at all been made of it. Yet this could not be so privately carried on, but that it soon came to a public knowledge; insomuch that one of the first answers that was made to it, charged monsieur de Meaux with this change. I do not hear, that he has ever yet thought fit to deny the relation, either in the advertisement prefixed to the later editions of his book, wherein yet he replies to some other passages of the same treatise, or in any other vindication: whether it be that such an imputation was not considerable enough to be taken notice of, or that it was too true to be denied, let the reader judge. 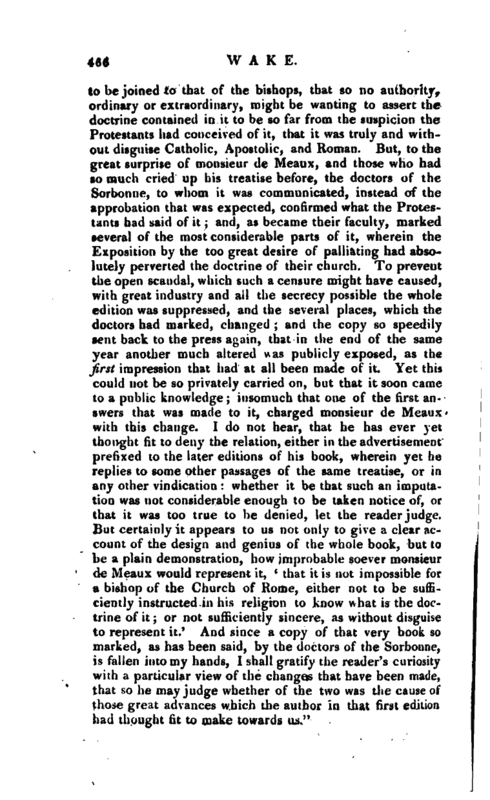 But certainly it appears to us not only to give a clear account of the design and genius of the whole book, but to be a plain demonstration, how improbable soever monsieur de Meaux would represent it, * that it is not impossible for a bishop of the Church of Rome, either not to be sufficiently instructed in his religion to know what is the doctrine of it; or not sufficiently sincere, as without disguise to represent it.‘ And since a copy of that very book so marked, as has been said, by the doctors of the Sorbonne, is fallen into my hands, I shall gratify the reader’s curiosity with a particular view of the changes that have been made, that so he may judge whether of the two was the cause of those great advances which the author in that first edition had thought fit to make towards us.” | Such was part of the preface to Mr. Wake’s “Exposition of the Doctrine of the Church of England,” 1686, 4to, which he was induced to undertake, by having observed that the French catholics with whom he had conversed, had, from ignorance, or the misrepresentations of their instructors, entertained very false notions of the points in controversy between the Churches of Rome and England. Mr. Wake afterwards wrote several tracts in the controversy against popery, which was carried on with great zeal during the latter part of tbie reign of James II. Among these we may mention, 1. “A Discourse of the Holy Eucharist, in the two gretu points of the Real Presence and | the Adoration of the Host,” 1687, 4to. 2. “A Discourse concerning the nature of Idolatry, in which a late author’s true and only notion of Idolatry is considered and confuted,” 1688, 4to. This was written against the “Reasons for abrogating the Test,” by Samuel Parker, bishop of Oxford. 3. “Sure and honest means for the conversion of all Heretics,” &c. 1688, 4to. This is a translation from the French, with a preface by our author. 4. “An historical treatise of Transubstantiation, wherein is made appear, that, according to the principles of that Church, this doctrine cannot be an article of Faith,” 1687, 4to. This was written by a member of the Church of Rome, and published by our author. 5. “Two Discourses of Purgatory and Prayer for the Dead,” 1688, 4to. 6. 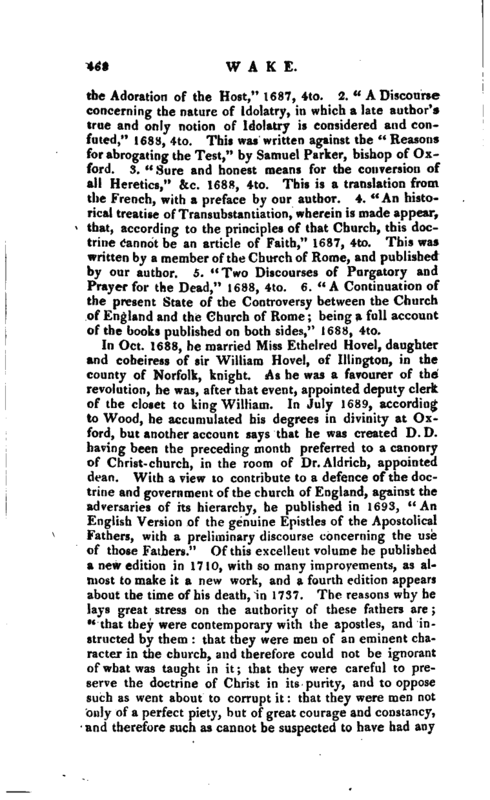 “A Continuation of the present State of the Controversy between the Church of England and the Church of Rome; being a full account of the books published on both sides,” 1688, 4to. In Oct. 1688, he married Miss Ethelred Hovel, daughter and coheiress of sir William Hovel, of Illington, in the county of Norfolk, knight. As he was a favourer of the revolution, he was, after that event, appointed deputy clerk of the closet to king William. In July 168.9, according to Wood, he accumulated his degrees in divinity at Oxford, but another account says that he was created D. D. having been the preceding month preferred to a canonry of Christ-church, in the room of Dr. Aldrich, appointed dean. With a view to contribute to a defence of the doctrine and government of the church of England, against the adversaries of its hierarchy, be published in 1693, “An English Version of the genuine Epistles of the Apostolical Fathers, with a preliminary discourse concerning the use of those Fathers.” Of this excellent volume he published a new edition in 1710, with so many improvements, as almost to make it a new work, and a fourth edition appears about the time of his death, in 1737. The reasons why he lays great stress on the authority of these fathers are; “that they were contemporary with the apostles, and instructed by them that they were men of an eminent character in the church, and therefore could not be ignorant of what was taught in it; that they were careful to preserve the doctrine of Christ in its purity, and to oppose such as went about to corrupt it: that they were men not only of a perfect piety, but of great courage and constancy, and therefore such as cannot be suspected to have had any | design to prevaricate in this matter; that they were endued with a large portion of the Holy Spirit, and as such could hardly err in what they delivered as the gospel of Christ; and that their writings were approved by the church in these days, which could not be mistaken in its approbation of them.” In July of the same year, he was preferred to the rectory of St. James’s Westminster. He took a very active part in that memorable controversy with regard to the Convocation, which we shall only notice so far as he was concerned, something having been already said upon it under the article of Atterbury. 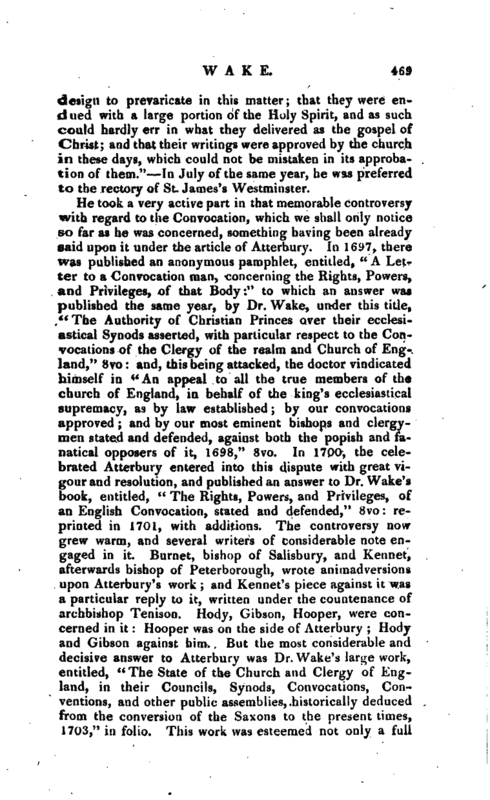 In 16i>7, there was published an anonymous pamphlet, entitled, “A Letter to a Convocation man, concerning the Rights, Powers, and Privileges, of that Body:” to which an answer was published the same year, by Dr. Wake, under this title, “The Authority of Christian Princes over their ecclesiastical Synods asserted, with particular respect to the Convocations of the Clergy of the realm and Church of England,” 8vo: and, this being attacked, the doctor vindicated himself in “An appeal to all the true members of the church of England, in behalf of the king’s ecclesiastical supremacy, as by law established; by our convocations approved; and by our most eminent bishops and clergymen stated and defended, against both the popish and fanatical opposers of it, 1698,” 8vo. In 1700, the celebrated Atterbury entered into this dispute with great vigour and resolution, and published an answer to Dr. Wake’s book, entitled, “The Rights, Powers, and Privileges, of an English Convocation, stated and defended,” 8vo: reprinted in 1701, with additions. The controversy novr grew warm, and several writers of considerable note engaged in it. Burnet, bishop of Salisbury, and Kennet, afterwards bishop of Peterborough, wrote animadversions upon Atterbury’s work; and Kennet’s piece against it was a particular reply to it, written under the countenance of archbishop Tenison. Hody, Gibson, Hooper, were concerned in it: Hooper was on the side of Atterhury; Hody and Gibson against him. But the most considerable and decisive answer to Atterbury was Dr. Wake’s large work, entitled, “The State of the Church and Clergy of England, in their Councils, Synods, Convocations, Conventions, and other public assemblies, historically deduced from the conversion of the Saxons to the present times, 1703,” in folio. This work was esteemed not only a full | and sufficient answer to Atterbury, but decisive with regard to the controversy in general. This letter gave occasion to two ironical pamphlets by the wits of the party, entitled, 1. “A short Vindication of the Lord Archbishop of Canterbury from the imputation of being the author of a Letter lately printed at Zurich concerning the state of Religion in England,” London, 1719, in 8vo. 2. “A letter to the Lord Archbishop of Canterbury, proving that his grace cannot be the author of thj | Letter to an eminent Presbyterian clergyman in Swisses land, in which the present state of Religion in England is blackened and exposed, and the present ministry are misrepresented and traduced,” London, 1719, 8vo. 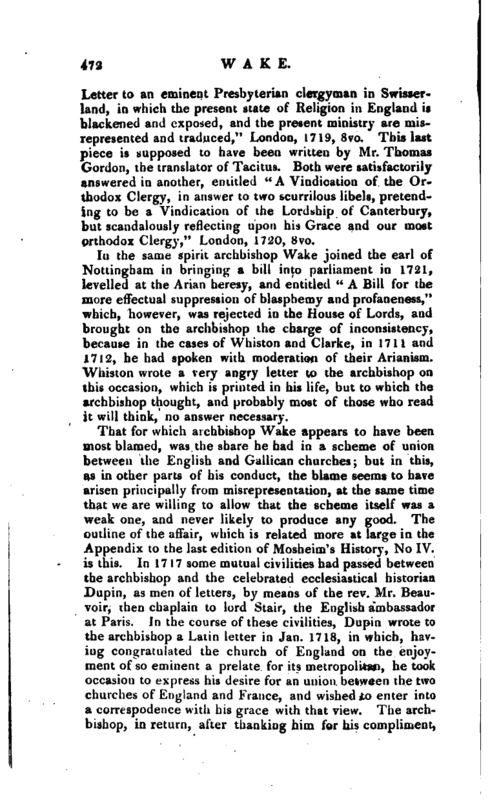 This last piece is supposed to have been written by Mr. Thomas Gordon, the translator of Tacitus. Both were satisfactorily answered in another, entitled “A Vindication of the Orthodox Clergy, in answer to two scurrilous libels, pretending to be a Vindication of the Lordship of Canterbury, but scandalously reflecting upon his Grace and our most orthodox Clergy,” London, 1720, 8vo. In the same spirit archbishop Wake joined the earl of Nottingham in bringing a bill into parliament in 1721, levelled at the Arian heresy, and entitled “A Bill for the more effectual suppression of blasphemy and profaneness,” which, however, was rejected in the House of Lords, and brought on the archbishop the charge of inconsistency, because in the cases of Whiston and Clarke, in 1711 and 1712, he had spoken with moderation of their Arianism. Whiston wrote a very angry letter to the archbishop on this occasion, which is printed in his life, but to which the archbishop thought, and probably most of those who read it will think, no answer necessary. 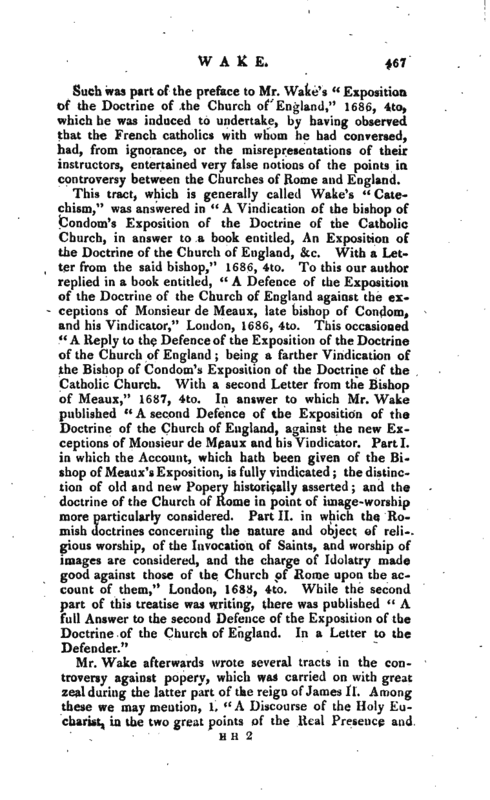 That for which archbishop Wake appears to have been most blamed, was the share he had in a scheme of union between the English and Gallican churches; but in this, as in other parts of his conduct, the blame seems to have arisen principally from misrepresentation, at the same time that we are willing to allow that the scheme itself was a weak one, and never likely to produce any good. The outline of the affair, which is related more at large in the Appendix to the last edition of Mosheim’s History, No IV. is this. In 1717 some mutual civilities had passed between the archbishop and the celebrated ecclesiastical historian Dupin, as men of letters, by means of the rev. Mr. Beauvoir, then chaplain to lord Stair, the English ambassador at Paris. In the course of these civilities, Dupin wrote to the archbishop a Latin letter in Jan. 1718, in which, having congratulated the church of England on the enjoyment of so eminent a prelate for its metropolitan, he took occasion to express his desire for an union between the two churches of England and France, and wished to enter into a correspodence with his grace with that view. 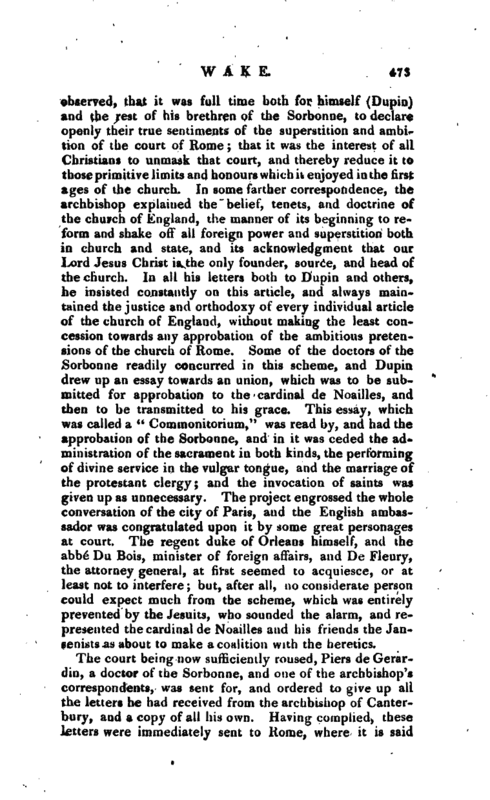 The archbishop, in return, after thanking him for his compliment, | observed, that it was full time both for himself (Dupin) and the rest of his brethren of the Sorbonne, to declare openly their true sentiments of the superstition and ambition of the court of Rome; that it was the interest of all Christians to unmask that court, and thereby reduce it to those primitive limits and honours which it enjoyed in the first ages of the church. In some farther correspondence, the archbishop explained the belief, tenets, and doctrine of the chuch of England, the manner of its beginning to reform and shake off all foreign power and superstition both in church and state, and its acknowledgment that our Lord Jesus Christ is the only founder, source, and head of the church. 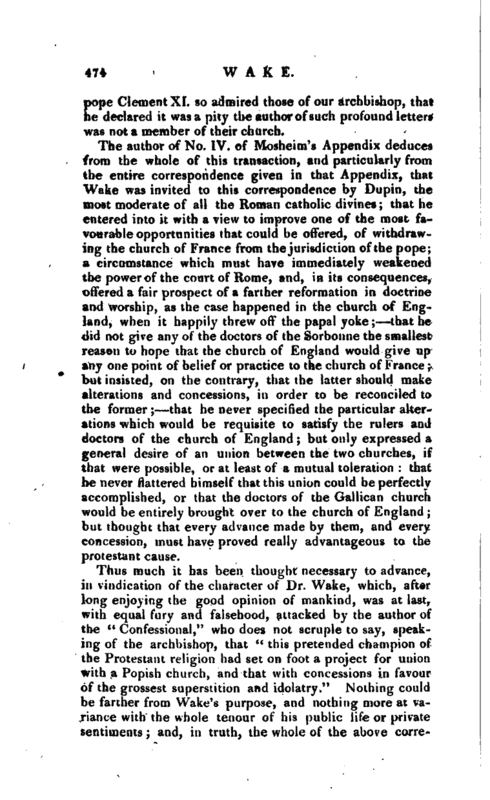 In all his letters both to Dupin and others, he insisted constantly on this article, and always maintained the justice and orthodoxy of every individual article of the church of England, without making the least concession towards any approbation of the ambitious pretensions of the church of Rome. Some of the doctors of the Sorbonne readily concurred in this scheme, and Dupin drew up an essay towards an union, which was to be submitted for approbation to the cardinal de Noailles, and then to be transmitted to his grace. This essay, which was called a “Commonitorium,” was read by, and had the approbation of the Sorbonne, and in it was ceded the administration of the sacrament in both kinds, the performing of divine service in the vulgar tongue, and the marriage of the protestant clergy; and the invocation of saints was given up as unnecessary. The project engrossed the whole conversation of the city of Paris, and the Engiish ambassador was congratulated upon it by some great personages at court. The regent duke of Orleans himself, and the abbe Du Bois, minister of foreign affairs, and De Fleury, the attorney general, at iirst seemed to acquiesce, or at least not to interfere; but, after all, no considerate person could expect much from the scheme, which was entirely prevented by the Jesuits, who sounded the alarm, and represented the cardinal de Noailles and his friends the Jansenists as about to make a coalition with the heretics. The court being now sufficiently roused, Piers de Gerardin, a doctor of the Sorbonne, and one of the archbishop’s correspondents, was sent for, and ordered to give up all the letters he had received from the archbishop of Canterbury, and a copy of all his own. Having complied, these letters were immediately sent to Rome, where it is said | pope Clement XI. so admired those of our archbishop, that he declared it was a pity the author of such profound letters was not a member of their church. The author of No. IV. 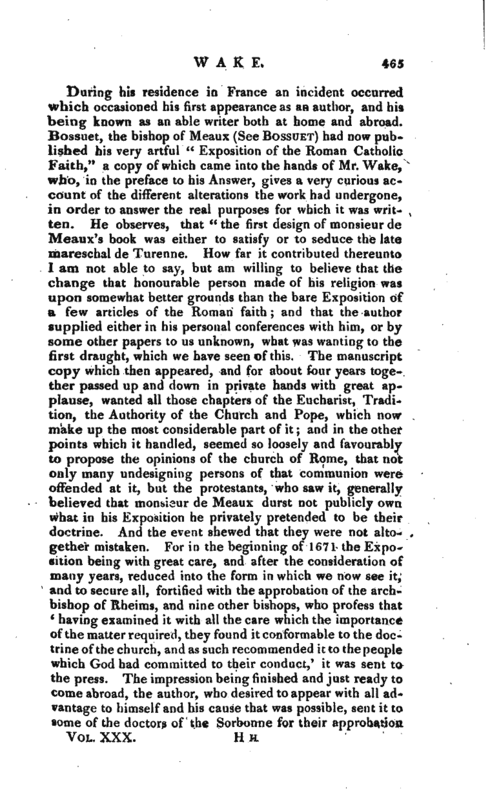 of Mosheim’s Appendix deduces from the whole of this transaction, and particularly from the entire correspondence given in that Appendix, that Wake was invited to this correspondence by Dupin, the most moderate of all the Roman jcatholic divines; that he entered into it with a view to improve one of the most favourable opportunities that could be offered, of withdrawing the church of France from the jurisdiction of the pope; a circumstance which must have immediately weakened the power of the court of Rome, and, in its consequences, offered a fair prospect of a farther reformation in doctrine and worship, as the case happened in the church of England, when it happily threw off the papal yoke; that he did not give any of the doctors of the Sorbonne the smallest reason to hope that the church of England wpuld give up any one point of belief or practice to the church of France; but insisted, on the contrary, that the latter should make alterations and concessions, in order to be reconciled to the former; that he never specified the particular alterations which would be requisite to satisfy the rulers and doctors of the church of England; but only expressed a general desire of an union between the two churches, if that were possible, or at least of a mutual toleration: that he never flattered himself that this union could be perfectly accomplished, or that the doctors of the Gallican church, would be entirely brought over to the church of England; but thought that every advance made by them, and every concession, must have proved really advantageous to the. protestant cause. 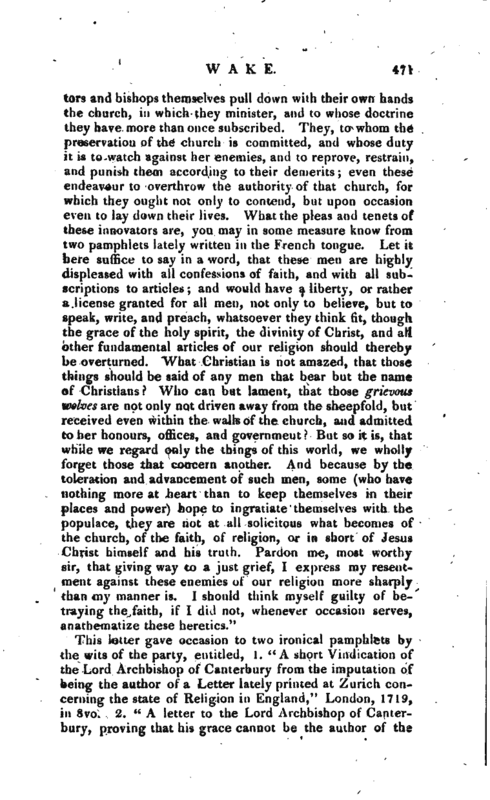 Thus much it has been thought necessary to advance, in vindication of the character of Dr. Wake, which, after long enjoying the good opinion of mankind, was at last, with equal fury and falsehood, attacked by the author of the “Confessional,” who does not scruple to say, speaking of the archbishop, that “this pretended champion of the Protestant religion had set on foot a project for union with a Popish church, and that with concessions in favour of the grossest superstition and idolatry.” Nothing could be farther from Wake’s purpose, and nothing more at variance with the whole tenour of his public life or private sentiments; and, in truth, the whole of the above | correspondence with the popish doctors was a matter of private sentiment, and neither party appears to have been authorized by, or to have consulted the church to which they respectively belonged. Had that been done, it is not quite clear that the plan, even as far as it has been divulged, would have been more acceptable in England than in France. The best part of it, the best object at which it aimed, was the separation of the church of France from the jurisdiction of the pope. Wake was of a pacific spirit: this appears in all his correspondence; and his correspondence appears to have extended to the leading men of every ecclesiastical community in Europe. He shewed a great regard to the foreign protestant churches, notwithstanding the difference of their discipline and government from that of the church of England; and blames those who would not allow their religious assemblies the denomination of churches, and who deny the validity of their sacraments. He declared, on the contrary, those churches to be true Christian churches, and expresses a warm desire of their union with the church of England. We must particularly notice his correspondence in 1719 with Mr. Jablonski of Poland, be-’ cause it has a direct reference to that part of his character which the author of the “Confessional” has so unwarrantably misrepresented. 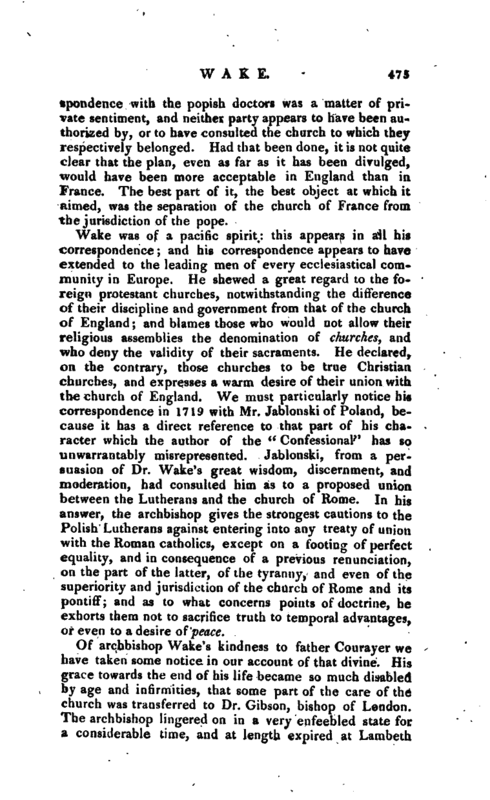 Jablonski, from a persuasion of Dr. Wake’s great wisdom, discernment, and moderation, had consulted him as to a proposed union between the Lutherans and the church of Rome. In his answer, the archbishop gives the strongest cautions to the Polish Lutherans against entering into any treaty of union with the Roman catholics, except on a footing of perfect equality, and in consequence of a previous renunciation, on the part of the latter, of the tyranny, and even of the superiority and jurisdiction of the church of Rome and its pontiff; and as to what concerns points of doctrine, he exhorts them not to sacrifice truth to temporal advantages, or even to a desire of peace. Of archbishop Wake’s kindness to father Courayer we have taken some notice in our account of that divine. His grace towards the end of his life became so much disabled by age and infirmities, that some part of the care of the church was transferred to Dr. Gibson, bishop of London. The archbishop lingered on in a very enfeebled state for a considerable time, and at length expired at Larnbeth | palace, Jan. 24, 1737, and was interred in a private manner at Croydon. He was in the seventy-ninth year of his age, but the inscription on his tomb erroneously fixes his death in 1733. 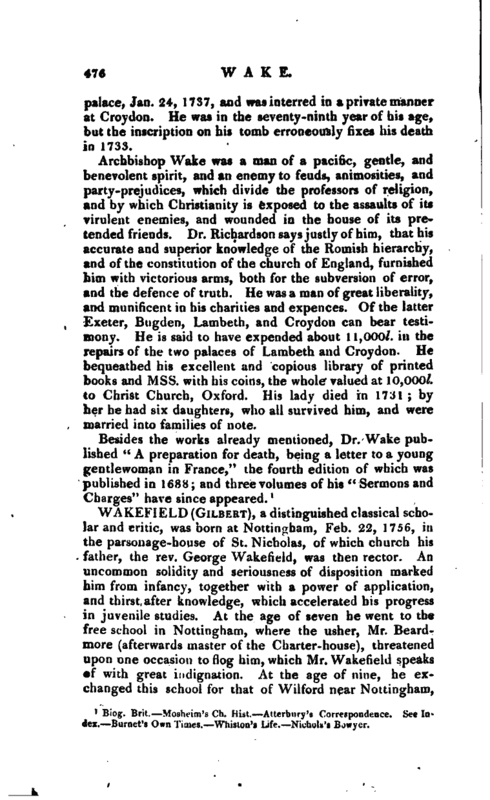 Archbishop Wake was a man of a pacific, gentle, and benevolent spirit, and an enemy to feuds, animosities, and party-prejudices, which divide the professors of religion, and by which Christianity is exposed to the assaults of its virulent enemies, and wounded in the house of its pretended friends. Dr. Richardson says justly of him, that his accurate and superior knowledge of the Romish hierarchy, and of the constitution of the church of England, furnished him with victorious arms, both for the subversion of error, and the defence of truth. He was a man of great liberality, and munificent in his charities and expences. Of the latter Exeter, Bugden, Lambeth, and Croydon can bear testimony. He is said to have expended about 11,000l. in the repairs of the two palaces of Lambeth and Croydon. He bequeathed his excellent and copious library of printed books and Mss. with his coins, the whole valued at 10,000l. to Christ Church, Oxford. His lady died in 1731; by her he had six daughters, who all survived him, and were married into families of note. 1 Biog. Brit. Mosheim’s Ch. Hist. Atterbury’s Correspondence. See Index. Burnet’s Own Times. Whiston’s Life. Nichols’s Buwyer.